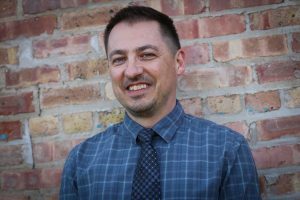 Hey this is Goran with Chicagoland Brokers with this week’s Chicago foreclosure listings today is January 23rd 2018 you can see here we have 29 properties for a brief look at the list and point out a few of the good ones. Again this week’s list has 29 properties if you ever want to subscribe to the list go ahead and click right here http://chicagorealestatereader.com/free-chicago-foreclosure-listings-update/ the list is updated every Tuesday morning you get an email to your inbox. Here’s a real good one that I thought it is Des Plaines it’s a 3500 square-foot Mini Mission 3 and 1/2 bath home for only $500,000 at 2273 Sprucewood Avenue in DesPlaines take a look at some of the photos on this one really nice looking house. You can use the image map above to view Chicago homes for sale by neighborhood on Chicago’s northside. You will get all the available houses for sale in the MLS with complete details and pics. Simply click on the light blue circles next to the Chicago neighborhood names. 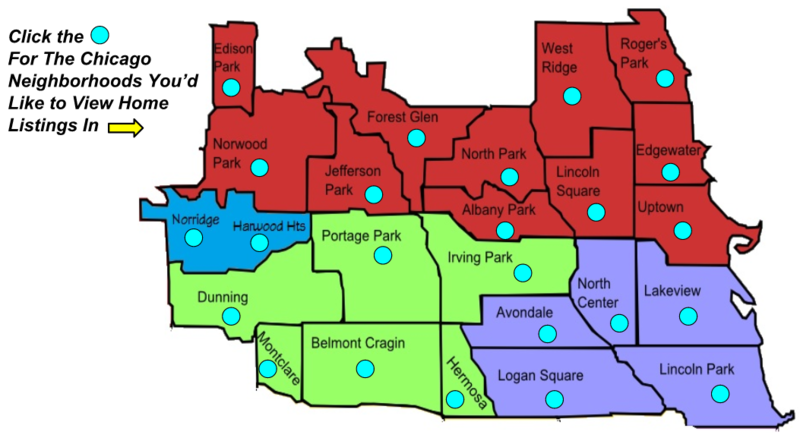 The neighborhoods included in this map are Edison Park, Norwood Park, Norridge, Harwood Heights these 2 towns are not in Chicago but Chicago wraps around them and it has the Chicago feel but you’re in a suburb. Other Chicago neighborhoods are Dunning, Montclare, Belmont Cragin, Hermosa, Portage Park, Irving Park, Avondale, Logan Square, Lincoln Park, Lakeview, North Center, Jefferson Park, North Park, Forest Glen, Albany Park, Lincoln Square, Uptown Edgewater, Roger’s Park and West Ridge Chicago homes for sale by neighborhood. You can also sign up to receive alerts for whenever a new property hits the market in any one or all of the above Chicago neighborhoods. Simply complete the easy form below and you will receive immediate alerts whenever a new home gets uploaded to the MLS. Your email will not be shared with anyone...unsubscribe anytime. This is an interactive map that will make your house hunting for Chicago homes for sale quick and easy. You can always come back to this page to search for the available houses in each Chicago neighborhood. Hopefully you find this map useful as other Chicago home buyers. 3 bedroom 2 bath brick ranch in Harwood Heights for under $150,000. 35 Chicago foreclosures in this weeks list. Arlington Heights 2 Bedroom Condo Foreclosure For Sale $67,000. About 920sf and it Has 2 Bathrooms. This Unit Can Be Rented. Norwood Park Townhome 928sf for 140k. Foreclosure in Niles 1.5 Story with 3 Bedrooms and 2 Baths For 281k. 4 Unit Building in Elmwood Park For Sale 3967sf for 301k. Get an Overview of Updated Foreclosure Listings and Sneak Peek Video Tours! 2 bedroom 2 bath condo in Mount Prospect for 52k. Norwood Park townhome with 3 bedroom and 1.5 bath listed for 155k. Chicago 2 flat in Albany Park 3700sf for 235k. Park Ridge brick ranch 2000sf with 3 bed 2.5 bath list price 240k. Tri-level foreclosure home in Niles 1527sf for 325k. Finish a 2400sf home in Park Ridge that’s completely gutted. 3 bed 3.5 bath for 338k. 26 Chicago foreclosure deals this week. 2100sf 4 bedroom 3 bath home in Schiller Park for 231k. Morton Grove brick ranch foreclosure for 241k. Arlington Heights split level home for 340k. Brick Cape Cod in Mt Prospect with 4 bed 2 baths listed for 160k. Foreclosure in Portage Park this brick English is occupied but priced for only 175k. Call or Text 312-217-4354 for more info or showings on these or other great Chicago real estate deals.